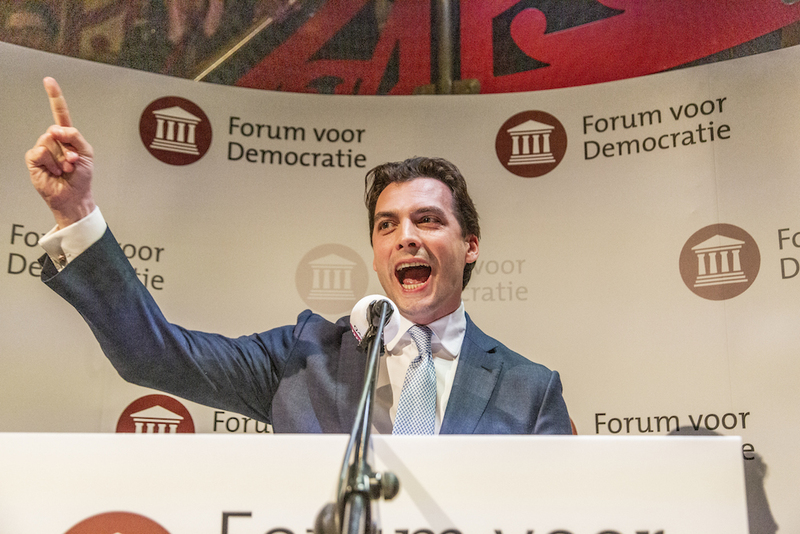 Thierry Baudet’s right-wing nationalist Forum voor Democratie has emerged as the big winner in the provincial elections and will take 13 seats in the 75 seat senate in May. The four coalition parties have lost their majority and will control 31 of the senate seats, forcing them to turn to opposition parties for support to get controversial legislation through. Prime minister Mark Rutte, in Brussels to discuss Brexit, told reporters that he would work to come to a ‘sensible majority’ in the upper house. Rutte said he would not try to come up with a pact, nor would he rule out any party, whether more left or right-wing than the coalition. Has Baudet really changed the political landscape? Baudet, who before the elections said that the government would have to drop its climate plans to get his support, told voters in a Twitter message that the party does ‘feel a responsiblity to ensure real political change, not just in the provinces but also in the senate’. GroenLinks, which now has nine seats in the senate after adding five to its total, would also be in a position to ensure a government majority, as would the Labour party which has seven. Meanwhile Forum campaigned in the provinces on national issues and now faces the problem of making sure it fills the seats it has won on the 12 provincial councils. As the biggest party in both Zuid-Holland and Flevoland, Forum will be charged with putting together a working coalition in the regions, and Baudet said on Thursday he has already approached former VVD senator Hans Wiegel to work on his behalf in Rotterdam. Big losers of the night were Geert Wilders’ anti-immigration PVV which is on target to lose four of its nine senate seats, and the Socialists which will sink from nine to four. Wilders, whose support has been declining for years and has fallen 40% in the provinces, described his party’s losses as ‘limited’. ‘Six seats is not nothing,’ he said, adding that that the ‘unique PVV voice’ will continue to heard in the senate. Turnout was up sharply on the last provincial vote, with some 56% of people casting their vote. It was highest (60%) in Zeeland and Utrecht. Check out the results in your area on the NOS interactive map.